In my previous post, I presented a preview version of googleVis that provided an integration with RStudio’s Viewer pane (introduced with version 0.98.441). Over 80% in my little survey favoured the new default output mechanism of googleVis within RStudio. Hence, I uploaded googleVis 0.4.7 on CRAN over the weekend. 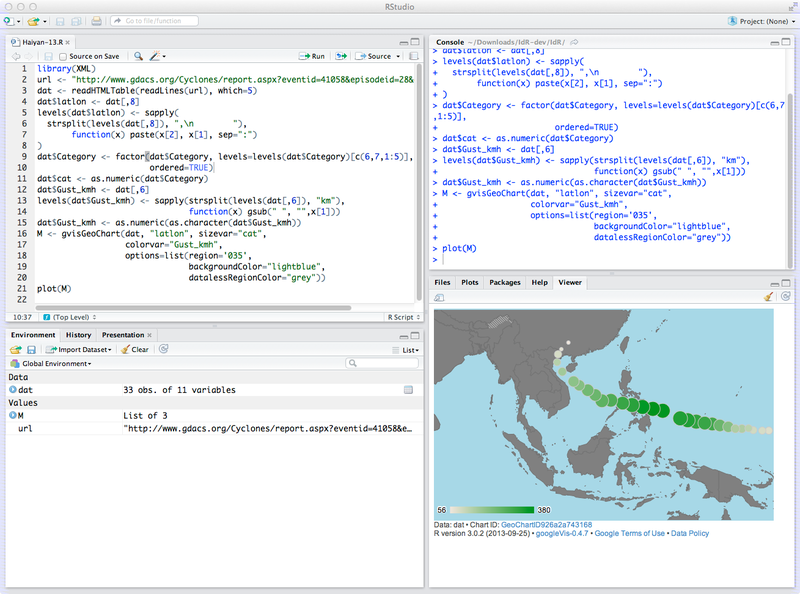 However, there were also some thoughtful comments, which suggested that the RStudio Viewer pane is not always the best option. Indeed, Flash charts and gvisMerge output will still be displayed in your default browser, but also if you work on larger charts and with smaller screen, then the browser might still be the better option compared to the Viewer pane - of course you can launch the browser from the Viewer pane as well. Hence, googleVis gained a new option ‘googleVis.viewer’ that controls the default output of the googleVis plot method. On package load it is set to getOption(“viewer”) and if you use RStudio, then its viewer pane will be used for displaying non-Flash and un-merged charts. You can set options(“googleVis.viewer” = NULL) and the googleVis plot function will open all output in the default browser again. Thanks to J.J. from RStudio for the tip. devastating typhoon track of Haiyan that hit Southeast Asia last week.